The challenge between JohnJo Kenny’s rink of Bill Gray, David Whyte and Tony Tierney and Peter Wilson’s rink of PJ Wilson, Neil Fyfe and Tom Roche will take place at Dumfries Ice Bowl from 11th-13th January, 2013. Saturday 12th Jan 2013: First session – 10.00am; 2nd session – 3.00pm. 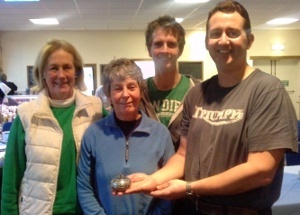 The team that won the world senior curling championships for Ireland last April lost in the quarter-finals of the recent Edinburgh International Seniors competition at Murrayfield ice rink. “We lost in the QF to Gary McFarlane. “Had a good weekend. Beat David Rutherford on Friday and then lost to Keith Prentice. Played David Clydesdale on the Saturday morning and had a cracking game. JJ went off after four ends due to bad knee. We were peels going down the last with the hammer. David Clydesdale played a great draw to the button with his last and I missed the ******. Lost by one. Then needed to beat Andy McGlynn convincingly to qualify. Was 10-0 up after six ends (JJ sitting out; yours truly skipping) so that was enough to do the job. “Played GMac in QF on Sunday morning. Ice like lightening and we didn’t react well to that at all. Went 5-1 down after five, lost a one in the sixth end, got two back in the seventh and ran out of stones in the last to lose 6-3. Held at Murrayfield Ice Rink in Edinburgh on Sunday 18th November 2012. For this bonspiel, attending members were divided up into six rinks who are drawn to play against one other rink. Arran’s team wom 8-1 and was the overall winner. After the Irish team won the gold medal in the World senior Curling Championship at Tårnby, Denmark in April 2012, Radio Ulster interviews one of the team. In the quarter finals of the European Seniors Invitation at Greeenacres Ice Rink in Scotland, the team played Per Carlsen of Sweden, with some revenge to be had for previous defeats; Johnjo lost to him in the Europeans in Basel to a last shot raised double and Bill lost to him in the semi-final of the Euro Seniors last year. The game started well for the Irish holding the Swedes to a single in the first, scoring a double themselves in the second and repeating the pattern in the third and fourth ends to lead 4-2 halfway through the contest. Carlsen scored a two in the next and then the Kenny team gave up a stolen 2 in the 6th end to go 2 shots down. The guys failed to react quickly to changing ice conditions and lost a bit of concentration and although had the chance to keep the opposition to a steal of one, a couple of misplaced shots allowed the Swede to score 2. The Irish replied with a single in the next and were well placed to steal in the last end but again failed to nail a couple of draws to the button (after the Swedes fluked a shot to the back of the T clearing a guard) and ran out of stones – hence the score of 3 against. This was a gutting defeat for the World Champions who felt that they had the momentum to go all the way in this competition but on reflection, the team were very proud of the run of victories they have produced since forming the quintet prior to the Worlds. The Irish men’s team were up against Italy last night after the schedule of play was rearranged inthe European Senior Invitation at Greenacres Ice Rink. Although the team struggled to start with the ice but they kept themselves in the game and a count of four and a steal of one should have heralded a comfortable win but the Italians came back in the last two ends scoring three shots to make the final score a rather tight 8-7 win for the Irish. In the ladies section Marie O’Kane’s seniors ladies team went down 7-6 last night to Margita Matuskovicova from Slovakia after losing earlier in the day to Scotland’s Barbara Watt.